I don’t know what is funnier. An awards show where they raffle off a vacuum cleaner (manufactured in the U.S., of course)—or the fact that I was really bummed I didn’t win it. 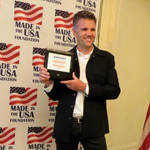 Nonetheless, I had a terrific time at The Made in the USA Foundation and Made Movement’s Hall of Fame Awards dinner. It may not be as glam as the Oscars or as raucous as the Golden Globes, but the businesses that got up to the podium at Shutters On The Beach gave impassioned, smart speeches, which is more than I can say for the movie award celebs sometimes. The dinner honors the achievements of American manufacturers in categories like jeans (L.A.’s Hudson snagged it) and wind power and office supplies. The five L.A. winners were: Glima, American Apparel, Tesla, Hudson Jeans, and Merle Norman. Actor Ed Asner gave out the awards with the foundation’s co-founder Joel D. Joseph (and his family). Asner is a riot and left before the awards concluded. During the evening his phone rang and his ringtone is a grumpy old man (him?) screaming, “Why don’t you answer me? !” over and over. His whole table got the giggles. Drea de Matteo popped by (someone in her family is in the furniture biz) but Martha Stewart was a no-show. Tesla designer Franz von Holzhausen took home a prize, noting the electric car’s ten year anniversary and the fact that they don’t owe the government any dough. Chevy got up later and made the same boast. I know I must be in the right biz (covering parties) when I find the speech of a fella who makes paperclips interesting, even inspiring.